Welcome to Casa Carina! 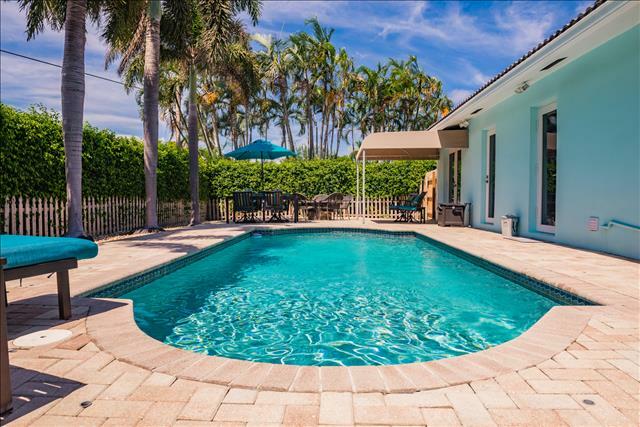 By The Sea Vacation Villas is pleased to offer this spectacular 4 Bedroom 4.5 Bathroom Heated Pool Vacation Home in the exclusive community of Hillsboro Shores! 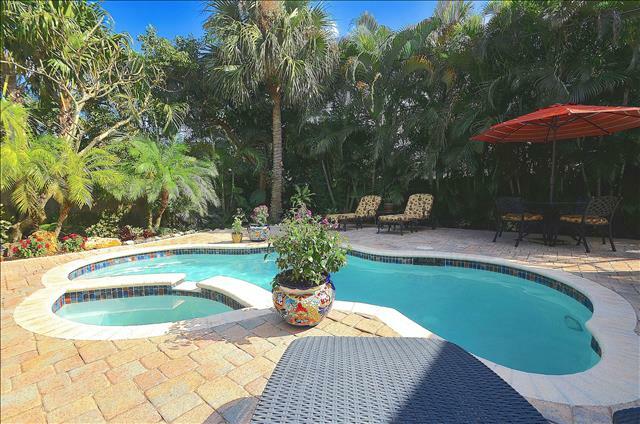 Casa Carina is the very definition of a Five Star luxury vacation retreat that is situated east of Ocean Boulevard / A1A and, to top things off, is equipped with a key to the private beach directly across the street from the home (you truly cannot get any closer). 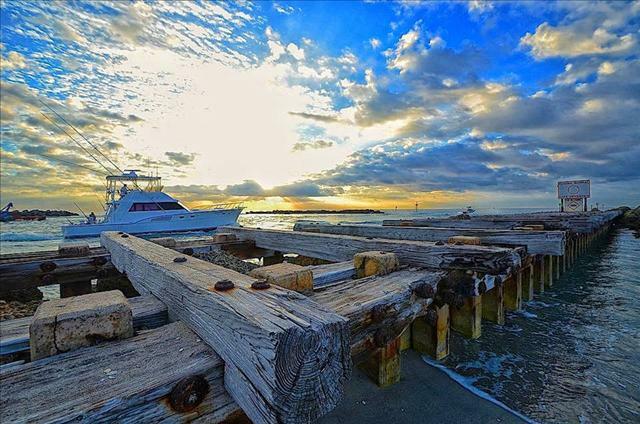 The private beach is breathtaking and offers picturesque, unobstructed, views of the Hillsboro inlet leading into the pristine Atlantic Ocean, not to mention the world-famous Hillsboro Lighthouse, which provides one of the most powerful lighthouse beams in the world. Absolutely no expenses were spared by either the property owner or management company when furnishing and preparing Casa Carina for the luxury vacation rental market! Upon entering Casa Carina, you are greeted by an exceptionally large open floor plan that is ideal for entertaining. The formal living area is equipped with two (2) leather sofas, a leather chair and a 60” plasma television with entertainment center for your enjoyment. The formal living area offers direct, unobstructed, views of the outdoor pool and lounge area. The formal dining table offers seating for eight (8), while the breakfast dining table, situated directly off the kitchen, offers seating for four (4). The large open kitchen is fully equipped with everything you will need while on vacation. The spacious and extremely private Master Suite is a luxury retreat in and of itself and is nothing short of spectacular. 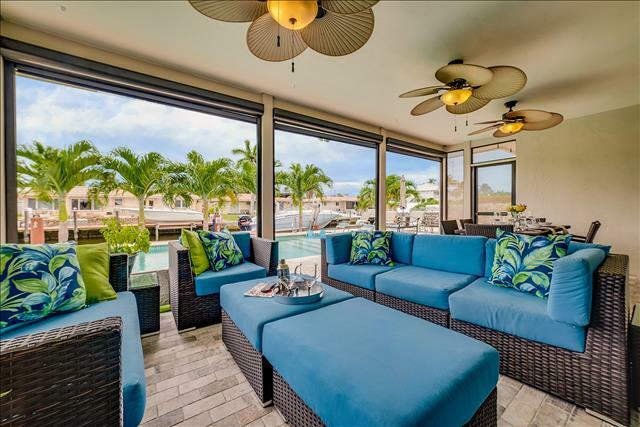 Furnished with a King Bed, two nightstands, a bedroom sofa and a plasma television for your enjoyment, the master suite is situated directly off the pool area and offers sliding glass doors for easy access. 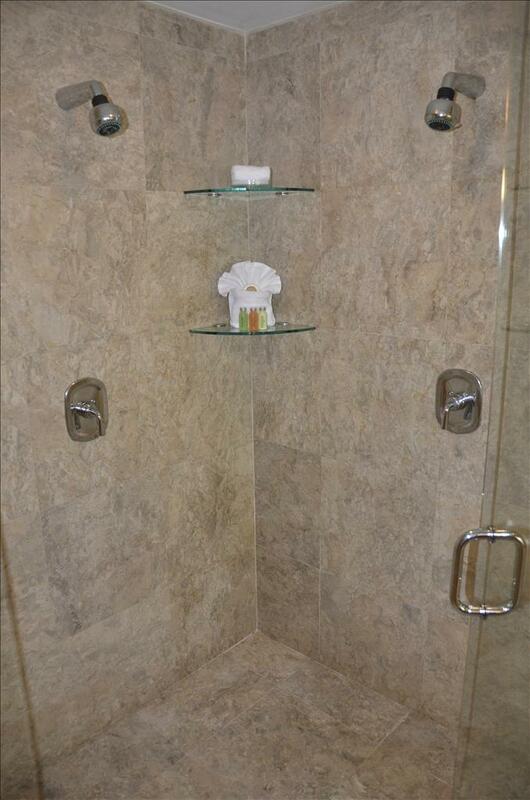 The master bathroom resembles that of a luxury spa and is equipped with a large custom marble shower (offering dual shower heads), a full-size jacuzzi spa bath, dual vanity sinks and separate lavatory with privacy door. Bedroom Two is equipped with a Queen Bed, nightstand and plasma television for your enjoyment. In addition, bedroom two offers fantastic views of the outdoor pool and lounge area. The en-suite full-size bathroom offers a large custom shower, a marble vanity sink and direct access to the outdoor pool and lounge area. Bedroom Three offers a Queen Bed, nightstand and plasma television for your enjoyment. The en-suite full-size bathroom offers a shower/bath and dual vanity sinks. Bedroom Four offers Two (2) Queen Beds, a nightstand, full-size dresser and plasma television for your entertainment. 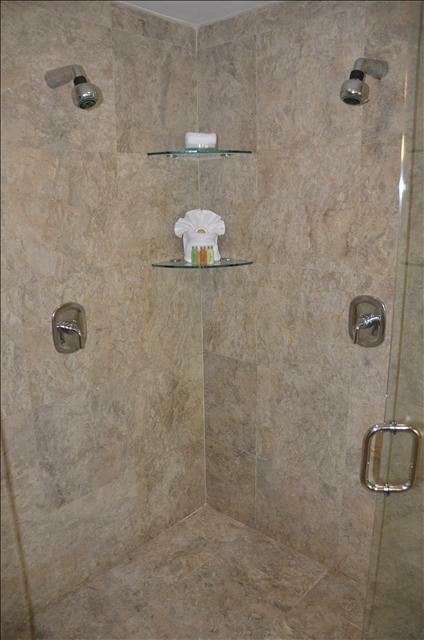 The en-suite full-size bathroom offers a custom walk-in shower and marble vanity sink. 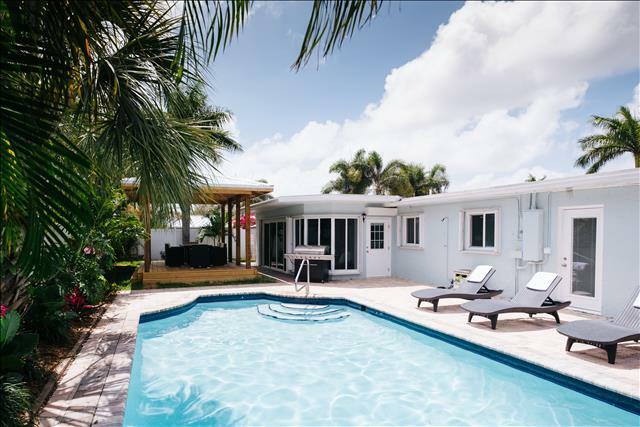 The rear yard, equipped with a spectacular custom heated pool, is a tropical oasis and is certainly an area in which you and your guests will not want to leave! The rear yard offers two outdoor dining areas with seating for six (6) at one table and four (4) at the other table. 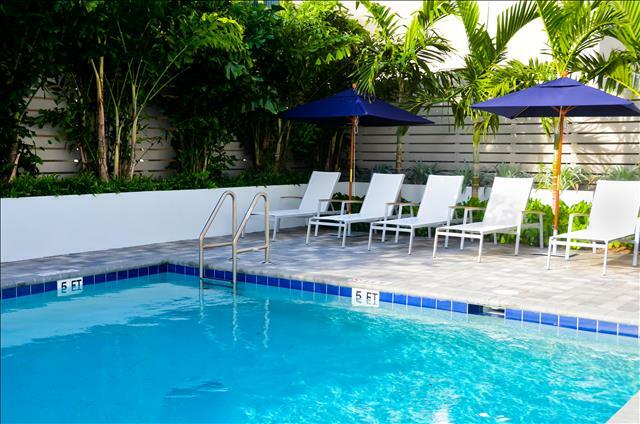 The large open pool deck is equipped with six (6) poolside lounge chairs. 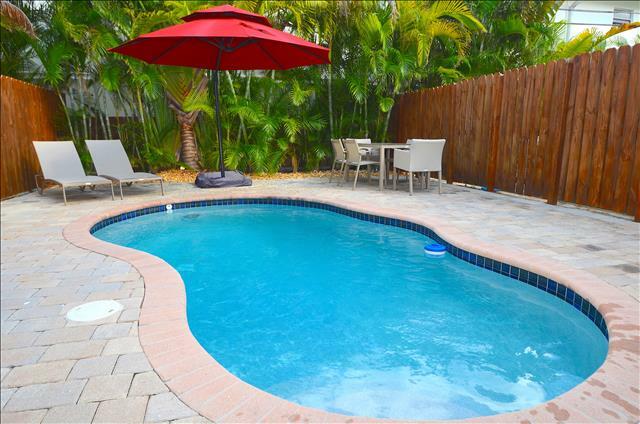 Casa Carina is equipped with a full size, walk-in, laundry room. In addition to offering cable television in all four bedrooms, as well as the living area, the home is equipped with wireless internet and local phone service. Wonderful home. This house was everything it was advertised to be. Plenty of room for everyone and the pool was great. We even had a daily visitor, "Coconut", the neighborhood cat. I would highly r...read more. "Casa Carina" satisfies on two important wants in a vacation property, location and style of house. The Hillsboro Shores area has a private gate leading to the Atlantic Ocean, steps away from the hous...read more. Our family of ten stayed at Casa Carina Christmas Eve to New Year’s Eve. Our three generations thoroughly enjoyed and loved the home, pool, access to the beach and the surrounding neighborhood. The be...read more. We stayed here for a week with our four children and loved absolutely everything about Casa Carina! The home was large and spacious with an enormous kitchen, which made it easy to prepare meals and en...read more. This is a beautiful home, as the photos show. We had a large family gathering, the spacious common area worked wonderfully for us. The kitchen is large and well equipped. This is the third house we ha...read more. Just as nice as the photos! 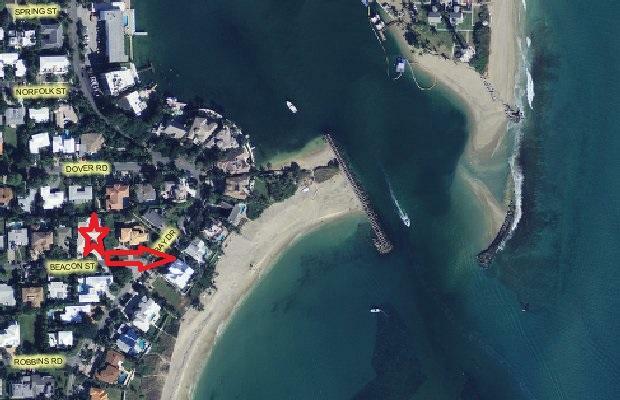 Lovely, quiet neighborhood with beautiful private beach just steps away. Amazing! Had everything we needed and more; beach towel, beach chairs, blender, coffee pot, toiletries, grill, washer/dryer. Steps to the beach! Restaurants within 2 miles. Less than 30 minutes from a...read more. 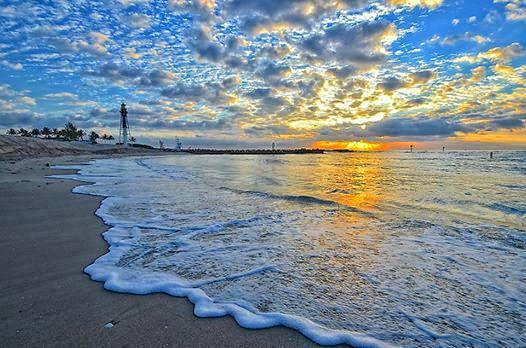 Pompano Beach (where Atlantic Boulevard meets the ocean) has been beautifully renovated with all new restrooms, lifeguard towers, a spectacular children's playground (including a water fountain play area) and offers private cabana rentals, is situated slightly over one mile from Casa Carina. The area offers ample parking and many options for dining, including Houston's, which is situated on the direct Intracoastal waterway. The public beach provides lifeguards 7 days a week from 9:00 am to 4:45 pm. All are welcome. Lauderdale by the Sea (where Commercial Boulevard meets the ocean) has been beautifully updated and offers pedestrians a wonderful experience by providing a new oceanfront pavilion, a new oceanfront lounge area with multicolored adirondack chairs and a multitude of first-class dining options, including Aruba Cafe, The Village Grille, 101, etc. Children will certainly want to visit Kilwins Ice Cream or Sloans Ice Cream, which are both excellent dessert options. 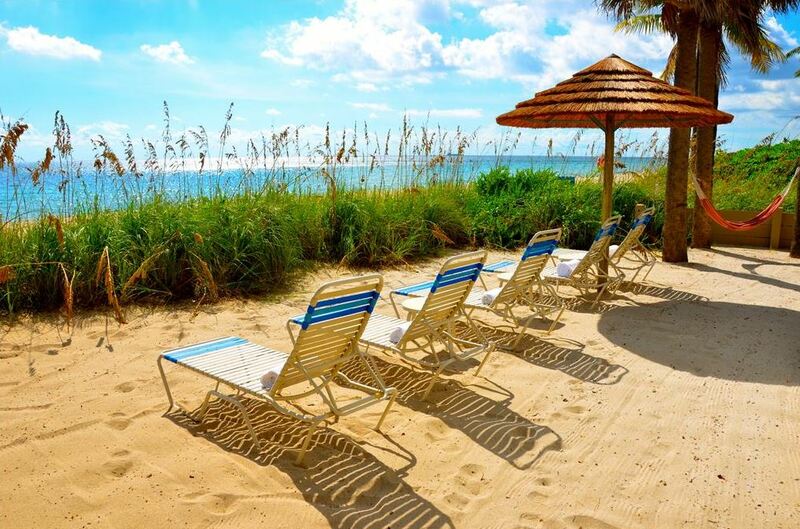 The beaches in Lauderdale by the Sea are known for being wide and offer families a wonderful, relaxing experience. Anglin's Fishing & Observation Pier has been open since 1963 and offer patrons 24 a day accessibility. 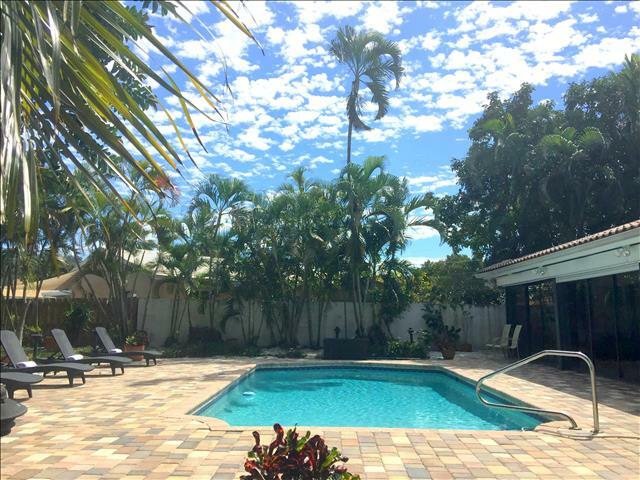 Casa Carina is located within, approximately, fifteen (15) minutes from Downtown Fort Lauderdale, including Las Olas, within, approximately, fifteen (15) minutes from downtown Boca Raton and within, approximately, forty (40) minutes from Miami and South Beach.